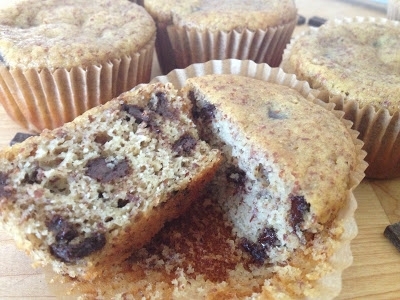 These grain free muffins are perfect- not too sweet, with just the right amount of chocolate. Try them out for a weekend breakfast treat, or something you can simply grab and take with you on a busy weekday morning! Enjoy! 1. Put 12 paper liners into a muffin tray and preheat your oven to 350 degrees. 2. Using an electric hand mixer, blend together everything but the chocolate chips. 3. Once a uniform consistency (it will be on the runny side! ), mix the chocolate chips in with a spoon. 4. Evenly divide the batter between the 12 muffin cups. 5. Bake for 15-17 minutes or until golden on top. 6. Eat up buttercup! Store them in the fridge so they dont go bad too quickly, or freeze them if you anticipate them lasting longer than a few days (but I kinda doubt that will happen).